Stopping to catch my breath I stuck the ice axe into the hard snow and turned around slightly. Backlit by an orange glow the Aiguille du Midi was a dark spike, no longer above, but below us. The first ray of sun broke across the horizon. Immediately the whole panorama lit up, the ice crystals sparkling just in front of us. It was magic, and we were heading up Mont-Blanc. A very special moment. This is EPIC! You can see it from pretty much any mountain in Grenoble, Savoie or even the Ecrins. And every time you always have to point it out. “Oohh!! You can see Mont-Blanc!” Don’t ask me why but it doesn’t get old. Maybe it’s the indistinguishable shape or the fact it’s so much taller than the rest but it does have a certain attraction. That being said, although since arriving in Grenoble I had planned to climb it, it wasn’t my priority. I preferred to do stuff closer to home, keeping it in reserve. But this year I had decided to definitely try and give it a go. Hearing that Sév and friends were going in May I didn’t waste a minute in asking to join. After weeks of looking at the weather it was finally time to decide. But with multiple storms and some decent snowfall by Monday it wasn’t looking good. Pushing the decision back to Wednesday, then Thursday. After checking multiple websites it looked like it should hold on Sunday, so decided to go ahead. The game was on! After a very late and sleepless Friday night I was driving to Chamonix. There were seven of us, and after sorting out the kit we took the cabin up to Plan de l’Aiguille. Although we originally wanted to go via the 3 Monts (Tacul, Maudit and Blanc), due to the conditions and the ominous seracs we decided to go via the refuge des Grands Mulets. This meant that although technically easier we had more than +1800 m to look forward to the next day. But before that we had to cross La Junction, in the Glacier des Bossons, as chaos of smashed blocks, chunks of ice as big as houses and huge crevasses. I had never been in such a tortured section of ice and snow, where you can just imagine the forces at work to throw up such an incredible landscape. I loved it! Cursing myself for being so tired we headed up the last climb in the deep fog that had settled during the afternoon. As I sweated up the turns, I caught a glimpse of snow falling from the face above me. As the slush hit the slope the whole thing started to go, and a slow stream glided past me several tens of metres away. Although not very big, the fact I couldn’t see anything coming gave me the necessary motivation to double-time up to the refuge. The hut in question is perched on a sharp spike of rock sticking out of the glacier. This means you have to climb up a steep and rocky “path”. A cable acts as a lifeline, as a fall from the top wouldn’t be recommended. Suffice to say all I wanted to do on arrival was sleep, which is what I did. Waking only for supper I grabbed the energy I could. 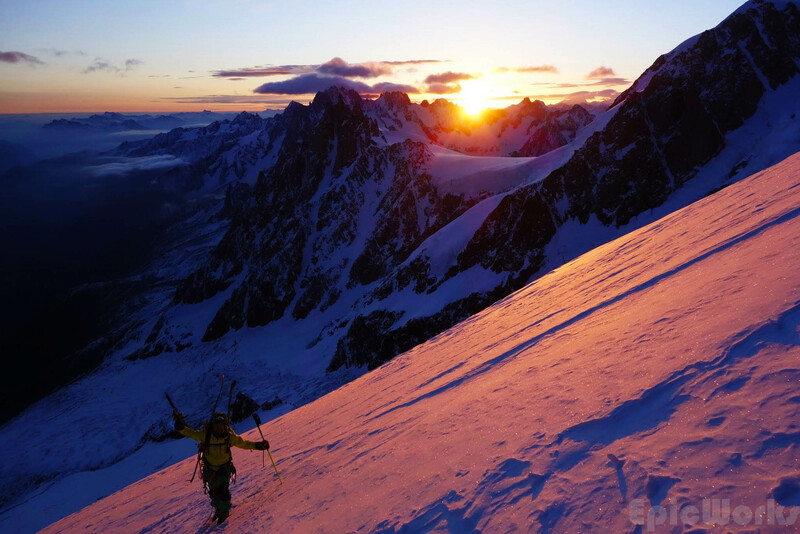 Heading off under the AIguille (Courtesy of S. Stemmer). The tiny dots of white light were disappearing above us. The refuge had coughed out its sardines, and everyone was putting on their skis or were already on the way up. With the alarm going off at 1:30 a.m. and a forced breakfast as well as the chaos and rush inside it was good to be on the snow. There are two main routes towards the summit from the refuge: the classic, up through the petit and grande Plateaux or via the north ridge of the Goûter (see picture). Although the first alternative is easier, it is exposed to massive serac fall. It’s a game of Russian roulette. In the dark. The choice for us was therefore easy, as well as most of the French. Even so, most of the lights headed off the other way and we were soon almost alone. Thankfully we were not the first and the fresh track lead the way up (thanks to the traceurs!). It soon became too steep and we shifted our skis onto our bags and roped up. Thus began the slow and steady conquest of Mont-Blanc. Halfway up ridge, sunrise painted the scenery the most incredible of colours. Looking down the steep slope we had already come a long way! Our 3 units kept going forward, stopping only briefly to put our skis on once it flattened out just under the Goûter. Straigh across we arrived at the refuge Vallot, and old meteorological station. A., one of the guys from our group wasn’t feeling well, and decided to abandon. Frankly, looking at the north face in front of us which we would have to ski later, I wasn’t feeling too good either! Roping up once again, Sév and I started up the arête des Bosses, taking the ridge towards the summit. Although definitely tired, we took a slow rhythm and I didn’t feel the altitude too much. Finishing off on a perfect snow ridge, white, long and dropping off on either side, we made it to the top! Sev hits the ridge. We are going to get this! All in all a great outing, good company and a great way to finish the ski season. I had decided to risk it being my last, and risk failure. But as everything turned out so well, the weather held just enough and we even skied some powder it’s time to hang up my skis for next season, knowing that next year it will be the final preparations for Kirg-Ski..!